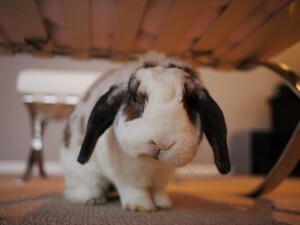 Betsy at The Life and Times of Bunnies is disapproving, probably of not getting her food fast enough. She is so cute! This entry was posted on Wednesday, February 12th, 2014 at 8:51 pm	and is filed under Bunnies. You can follow any responses to this entry through the RSS 2.0 feed. You can leave a response, or trackback from your own site. She looks very cute when she is disapproving!